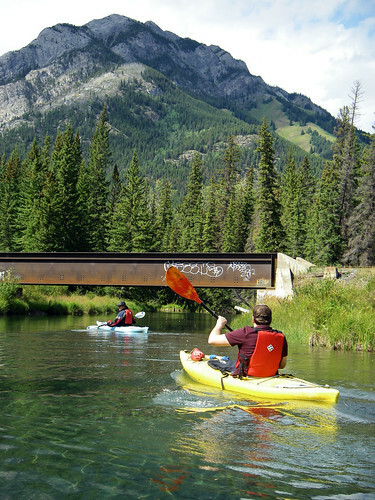 I'm pleased to say, Banff turned into an annual event for us! 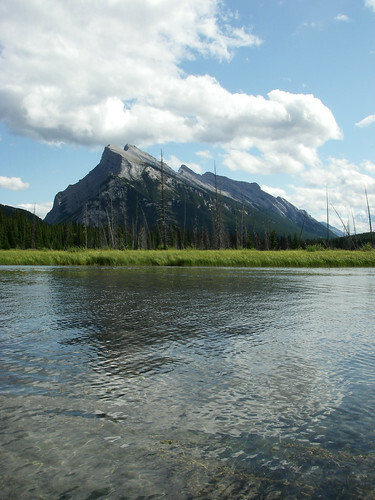 Today we returned to the Bow river for a nice relaxing paddle around the Vermilion lakes. 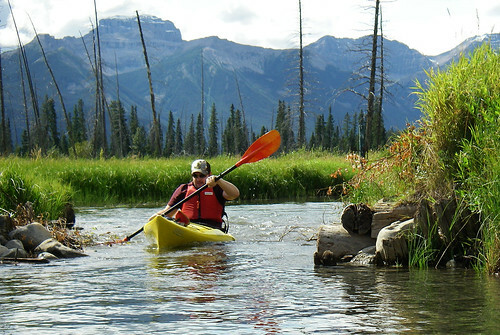 The River was at a lot higher level this year compared to last, so the little tributaries and lakes were open for paddlin'. We decided to see how far we could get along the back waters, as about 4 lakes make up the Vermilion lakes and they're all interconnected. The morning started with a brisk drive from Golden to Banff - one of the nicest drives out there. We got to town and were met with a bustling place. Banff was hopping! We visited Blue Canoe again and were given the same Old Town Dirigo 12 foot boats as last time. They're pretty fun and maneuverable boats. We got to test their muster this time around. 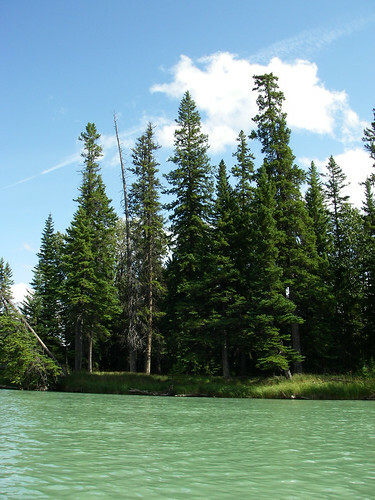 We launched into a stiff running current in the Bow river. Just as we left blue canoe's little hut we kept to the right and into a maze of little creeks and grasslands. Needless to say the view out here is spectacular. 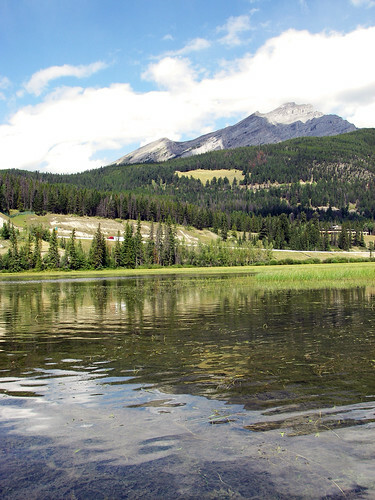 The large mountains that surround Banff loomed and the weather was made for t-shirts. As we made it into the first of the lakes, we realized that the water level wasn't _that_ high after all. The lake level was under a couple of feet deep and large weeds had grown all over the bottom making for a bit of a fight. We played around in the lake looking for the path to the next lake. We eventually found it - impassable. We were totally not making any progress over the silty bottom. We had to pole our way out of the muck. We tried our best not to disturb the bottom, because a shovelful of mud out there smelled exactly like pure sulfur. It was time to go back to the main river to get a photo of the trains that frequent this place. We had to fight our way back up some of the tributaries that had counter-currents flowing through them. Though the current in the river made for a bit of slow going, it was still really peaceful. We waited to see if a train would come by, but no such luck. 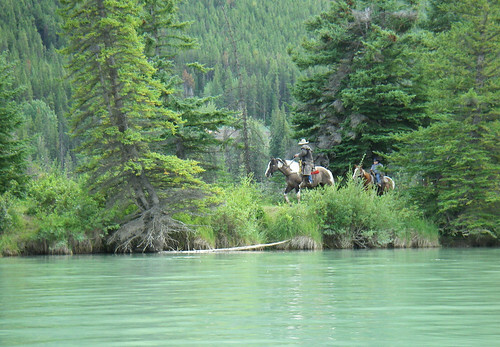 Instead I took some photos of a family out on horseback beside the river. I'll have to give that a go one day. It was time to head back to the rental place, so we turned around and let the current take us back. Just as we got to the shore, Greg shot ahead and grabbed his camcorder and got some footage of us drifting back to the beach. After a good day of paddling, we rewarded ourselves with a giant plate of Nachos at wild bills in Banff. If you need nachos, this is THE place. Make sure to add chili! It's been a couple weeks since I've been on the water, but this weekend was shaping up for some excellent paddling conditions. Low currents and generally nice temperate conditions were in the forecast. I went with the usual paddling gang out to Discovery Island today. I was pretty intent on circumnavigating Discovery island, and nothing was going to change my mind. When I got down to the beach, however, Chatham and Discovery islands were missing! This morning was the official welcome of Fogust. A rather large ribbon of fog had snaked its way out across Haro to Cadboro bay, and it was clear that it was fast approaching white-out conditions. We packed up the boats and launched into a dense fog bank, trusting that our gear and wits would lead the way. If any day was a good day to visit the Cadboro Buddha, it was today. But we didn't. 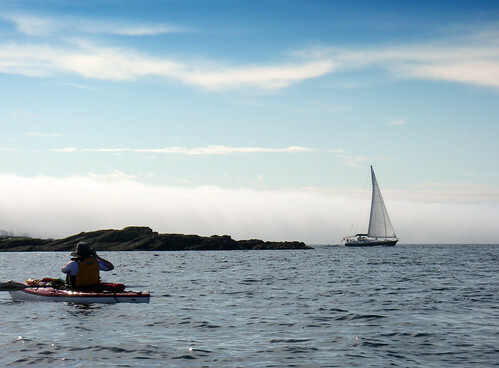 The fog was too thick to see much of anything, so we just paddled in the direction that we thought was Flower island. After the fog dropped visibility to less than 1/4 mile, it let up as soon as it had come. We were again under pleasant, warm sunlight. Sailboats were out in force this morning and some really fancy ones with Genoas and spinnakers faded in and out of the fog. 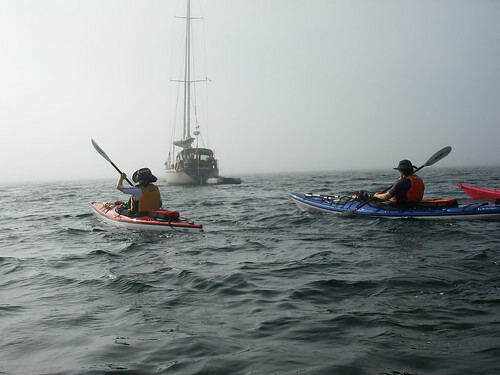 A boat somewhere in Juan de Fuca called in more fog to the coast guard, and sure enough, it was back! 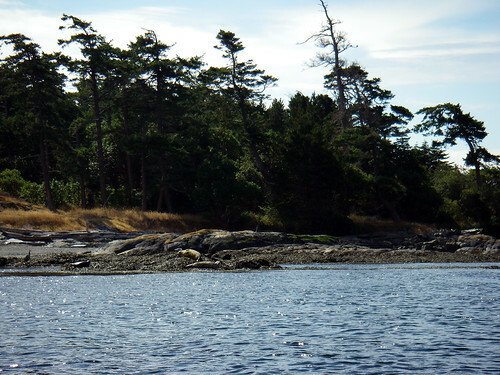 Alison and I paddled out to Jemmy Jones island while the rest hung back. We saw the huge fog bank roll across the water and suddenly we were in some kind of bizarre dream stage - just Jemmy Jones, some kelp and a white wall all around us. You could hear the creepy mechanical noises of boats whizzing by and moments later the wake would smash into the island. Our friends appeared behind us out of the mist and the wall slowly gave way to blue skies. As soon as it was clear enough to see the outline of Chatham, I headed across Baynes toward Strongtide islet. It just got brighter and brighter outside and the crossing was dead calm as predicted. 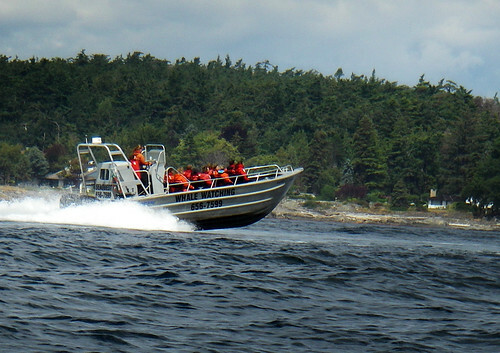 I saw a few bits of standing waves off of ten mile point, but they were not very powerful. I reached Strongtide and had a look around, but I didn't see that anyone had followed me at first. I took a few photos and poked my head back out to see the crew crossing over from Jemmy Jones. Once we met up again, it was clear we had different intentions for today. My plan was to circumnavigate Discovery and some of the others wanted to see more of Chatham. So we parted ways. To read more about the Chatham mission, you should navigate over to Kayak Yak. Alison and I headed out and around Discovery island. 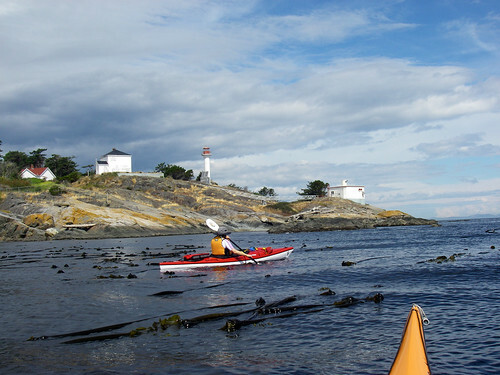 There were people camping all over the island and lots of brightly colored kayaks up on the beaches. Discovery island is bigger than I expected, and the current around it must be formidable in strong currents. Even during slack, there's many little rivers mostly confused eddies. The two southern points are really rocky at even mid tide cycle. I bottomed out slightly near commodore point and Alison got rather stuck just moments later in the same bunch of rocks. The strongest currents were out near Sea Bird point, though with a very sudden change in direction from back eddies to a coherent beam. It would have been a lot easier to paddle with more speed if it weren't for the world's largest kelp beds slowing the mission down. Just on the other side of Sea Bird point is a cool little lighthouse and a horn bank. 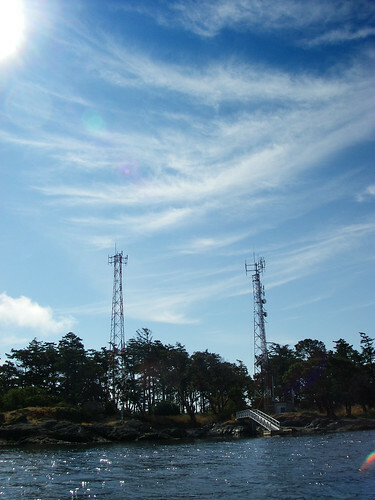 The lighthouse is connected to the other buildings on the site with a system of bridges. Unfortunately not much of a story here as this lighthouse is automated and the horn is completely defunct, but it's fun to go read all the neat history behind it. 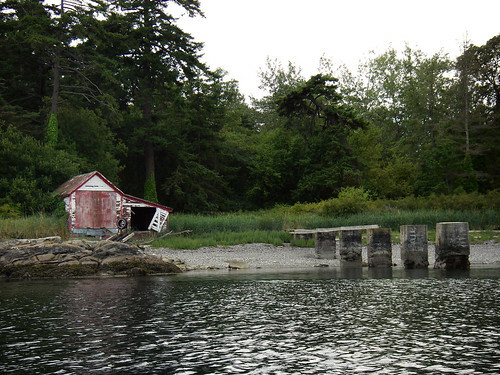 Just south of the lighthouse is a little house with a foundation for a boat dock. Sure doesn't look very cozy. I really had no idea that there were any permanent settlements on Discovery island these days, but there they are. In the narrow, shallow passages between Chatham and Discovery are a number of seal haul outs. It's pretty adorable seeing seals laying on the last bit of rock as the tide rises. 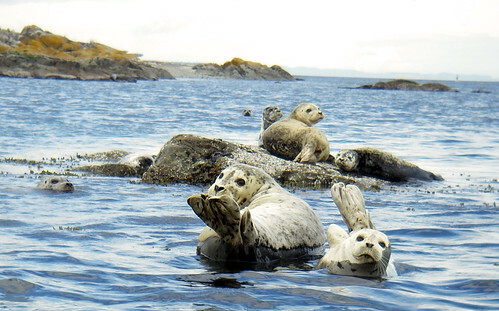 The seals were making all sorts of noises to one another and they were pretty unhappy with us being there. The tiny current moving through the islands was enough to keep us moving without having to disturb them too much. I noticed lots and lots of seal pups hanging around the parents. There are also a whole lot of eagles in the area, just keeping an eye out for food. One eagle was perched right at the water's edge and took off when he saw my giant orange boat. It was time to head back to reality, so we began the trip from Strongtide back to Jemmy Jones. Baynes was absolutely packed with power boats and we had to wait patiently as they passed us. Some of the boats kicked up some pretty freaky wake, but Alison and I mostly jumped right through them. When we met up with the rest of the group at Cadboro bay, it sounds like they had a lot more wake to contend with on their return trip. Overall, it's good to be back in the kayak after some time away.